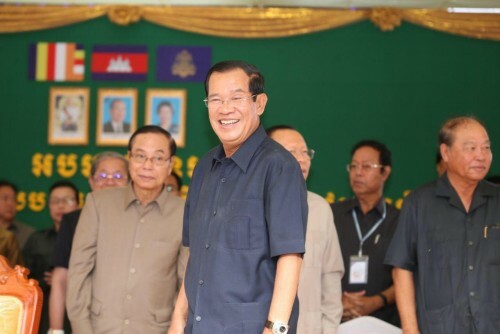 Prime Minister Hun Sen is optimistic that Cambodia could achieve the vision of becoming a high middle-income country by 2030 with the assistance of Japan and China, addressing to 18,467 workers from 14 factories in Kampong Speu Province on Wednesday. “We developed from a so-called poor country to a low middle income country, and we have a vision to be a high middle-income country by 2030,” said Prime Minister Hun Sen.
“Japanese Prime Minister Shinzō Abe said that Japan will assist Cambodia to achieve a high middle-income. Chinese President Xi Jinping as well as Chinese Premier Li Keqiang have also repeatedly expressed support for Cambodia’s development,” he added. He highlighted the efforts of the Royal Government of Cambodia to invest in rice warehouses and drying factory so that the government can buy rice from farmers, protect the rice price, and process rice for export. “We invest strongly in the framework of the entire process of rice mills, dryers and warehouses to buy rice from farmers […] Now we put millions of dollars to the geoscience of rice milling plants,” said the premier. The Royal Government planned to establish a bank with an initial investment of $100 million in order to support and provide capital for small and medium enterprises. He added that Cambodia is preparing to build cassava processing factories that could process 14 million tons of cassava annually. On top of that, the government also considers pepper, durian, and rambutan. Prime Minister stated that the government’s industrial policy will not overrun the agricultural sector, but to make sure both sectors grow together.